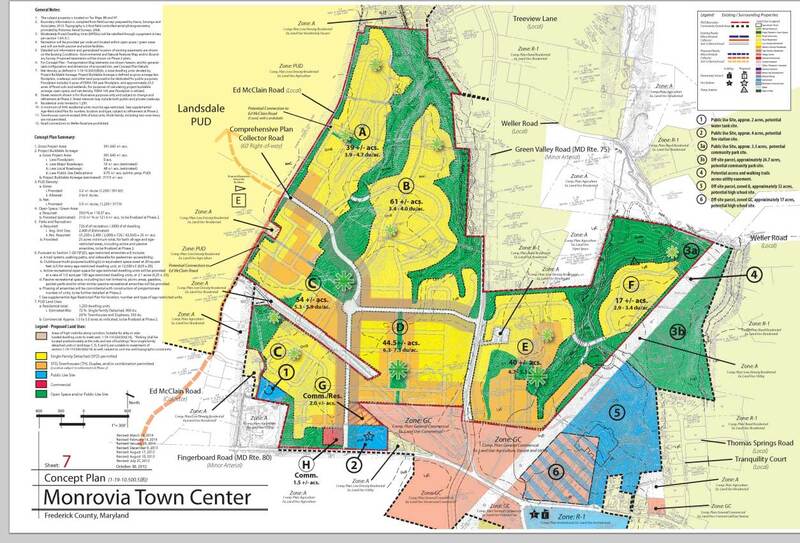 On April 23, 2014, the BOCC voted to approve the zoning change for Monrovia Town Center from Agriculture to a Planned Unit Development (Rezoning Case # R-12-02) and the proposed Developer Rights and Responsibilities Agreement (DRRA # 23-06). This zoning change and the corresponding DRRA will help to promote a balance of planned residential growth in that area of the county. It will help bring badly needed road improvements to this part of the county, and it will provide substantial funding for these improvements that would not otherwise be obtained. This zoning change is consistent with growth plans for Frederick County that have been a part of the County’s long term plans for forty years. I will explain my reasons in more detail below, after I give some background information about this planned development. At this point I have reviewed over a thousand pages of material (including applications, petitions, emails, letters, comments and analysis) submitted for our review on the MTC applications. This review process has gone on for over a year. In addition, there have been approximately two dozen hours of testimony presented to the Board, presenting dozens of issues and factors that I have weighed, evaluated and considered. I will not attempt to address every one of these in this memorandum, but I will address some of the major concerns and reasons why I support the modified MTC project. PROCEDURAL BACKGROUND. 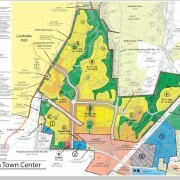 Following passage of a new Comprehensive Plan by the Board of County Commissioners on September 13, 2012, Roy Stanley and Howard Payne, two principal owners of 457 acres of land north of the intersection of Routes 75 and 80, contacted the Frederick County Community Development Division regarding their proposal to apply for a zoning change to build an 875 unit, non-age-restricted development (called Monrovia Town Center Planned Unit Development [MTC]) on their land. County staff suggested that the owners expand the size of the proposed development and offer some land to the County for use as a high school. Thereafter, the MTC application was filed with the County, requesting rezoning for a development of 1,510 homes and offering a 49-acre site for a county high school. LAND PLANNING HISTORY. Initially, it is important to understand some of the history of the Monrovia Town Center development project. The proposed MTC project is located on approximately 457 acres north of Md. Route 75 at or near the intersection with Md. Route 80. With only a minor, recent exception, this area has been continuously planned for residential development since 1972 (as reflected on the County Comprehensive Plans for 1972, 1978, 1984, 1993, 1998, 2004 and 2012). The only exception was for approximately two years (from 2010-2012), when the previous BOCC down-zoned this, and approximately 200 other properties throughout the county, in a controversial decision that reversed decades of planning by ten prior County Boards. The prior BOCC also cut back the municipal growth boundaries of almost every city in the county, and that Board also passed an APFO which sought to invalidate the APFO of every city in the county that was less stringent than the County’s APFO. This led the most populous cities in the County to sue the County to declare the County’s new APFO term to be invalid. In 2010 the citizens elected a new BOCC, which promptly acted to reverse the actions of the prior Board, and restored most of the down-zoned lands to their previous land use designations. Hundreds of citizens in this County were aggrieved by the draconian actions of the prior Board, which, by the stroke of the pen, eliminated valuable property rights that they had worked hard to acquire. It is important for the County to be consistent and reliable and to be as predictable as possible in the plans and policies it passes for the protection and well-being of us all. It is an important principle of proper government, that long-standing land-use plans should not be eliminated, except for compelling reasons. This principle was ignored and disregarded in the wholesale down-zonings of the prior Board. The prior Board held many meetings before it took its drastic action, but that action evoked widespread opposition to it, and correcting it became one of the main campaign issues in the 2010 election. It was certainly one of my principle pledges—to correct the down-zonings in that Comp Plan, and to restore property rights that were (in my opinion) wrongfully taken. The majority of this Board was elected, in part, to restore those property rights, including the property rights of Mr. Stanley and Mr. Payne. The election of the majority of this Board was clearly a mandate to restore those rights. For a year-and-a-half this Board underwent a thorough Comprehensive Plan review, which resulted in a restoration of most of those properties to their previous status. This Board eliminated the term in the County APFO that was offensive to the municipalities, ending that litigation. During the Comprehensive Plan review, which was completed in September of 2012, there was virtually no objection from residents in Monrovia to restoring the land use plans for the Monrovia Town Center. It was not until after that lengthy and thorough review was completed that Monrovia residents began to complain about development of the land where the MTC is proposed. PLANNING PERSPECTIVES. One of the roles of the BOCC is to plan for future land use in the county, and to do so from a county perspective—meaning that the location of future roads, residences, jobs, parks, schools, etc. should be selected from a point of view of what would be best for the entire county, including regional considerations. It was from this perspective that many prior Boards consistently designated the Monrovia area for residential growth beginning in 1972. Homes in this area are accessible to employment in the Baltimore, Washington, D.C. and Frederick regions—making this an ideal location for residential growth. This area is much more desirable for residential growth than areas north, west and southwest of the bottleneck of roads in Frederick City. The reason for this is that the most congested traffic area in the county is along U.S. 15 in Frederick City, where there are morning and evening traffic jams every weekday. This congestion affects all residents of the City, it affects all county residents who have to pass through the bottleneck twice a day, and it affects the regional traffic that has to pass through the bottleneck. For the most part, any new residences in the Monrovia area will not exacerbate the Frederick City bottleneck situation. New residences in Monrovia have access to the best job opportunities in the state without requiring their inhabitants to go through the Frederick bottleneck. Routes 75 and 80 both provide key transportation links in the Monrovia triangle. The need for those roads to be improved has been apparent for many years. But until the BOCC made those road improvements a high priority in its request for funding to the State, it was guaranteed that the State would not allocate funds for it. DRRAs for new projects in Monrovia will provide some key road improvements. County requests for state funding will provide additional assistance. No area for residential development is without problems and obstacles; and they certainly are present in Monrovia. Any development must be planned to solve those problems as concurrently as possible. It has never been a general practice to require that all infrastructure improvements be in place before an approved development can begin. Rather reasonable concurrence of improvements is required. This type of planning is being proposed for the MTC. THE PROCESS. Community Growth Areas are set by the County’s Comprehensive Plan. The 2012 Comp Plan restored the residential growth area to the land in the MTC application. The next steps for MTC was to request a zoning change (from Agriculture to Planned Unit Development) and to propose a DRRA. For all practical purposes, the two steps are pursued simultaneously, but the zoning change is sometimes considered and decided before considering and approving the DRRA that accompanies the project. The zoning application can be approved if the proposal meets the county’s requirements for certain infrastructure improvements (set forth in the County Zoning Ordinance 1-19-3.110.4 and 1-19-10.500.3). The MTC application was approved by the County Planning Commission by a 4-3 vote. The County staff, led by Jim Gugel, Ron Burns and Denis Superczinski (having decades of experience in land development rules and procedures), determined that the proposed MTC request for 1510 homes, without any age-restricted requirement, satisfied all the County requirements. Once the application was reviewed by the Planning Commission it came to the BOCC for its decision. JANUARY HEARING BEFORE THE BOCC. At the three days of hearings on this project before the BOCC in January, many citizens raised multiple objections to various aspects of the project, including concerns about inadequacy of Route 75 and excessive impact on other roads and schools. The majority of citizens expressed the view that a reduction of the density and adding an age-restricted limitation would eliminate some of the adverse impacts. The BOCC heard and understands those concerns, and the modifications imposed by the BOCC are a substantial response to those concerns. Although the proposed MTC project was technically in compliance with the County requirements, the BOCC added substantial modifications that will reduce the impacts of this project and make it more acceptable to existing Monrovia residents. Not all objections raised at the hearing were addressed in the modifications proposed and passed by the BOCC. A number of citizens complained that there was insufficient specificity offered as to when and how Route 75 would be improved and when and how new schools will be built. But at this stage of development, it is both premature and impossible to present all the detailed specifications and projected completion dates for a project the scope of which had yet to even be approved. Many of the objections raised at this hearing about “undetermined” aspects of the project are not valid objections; they do not indicate an understanding of the development process. Similarly, some of the criticisms voiced against County staff were unwarranted and wrong. Insults leveled at some of the County staff was rude and inappropriate. The County Planning and Development Staff has done excellent work. Specifically, Jim Gugel and Denis Superczynski did an excellent job in handling cross-examination, much of which was argumentative and insulting, and which never would have been permitted in a court of law. The insults that were made of them were wrong and were out-of-line. Perhaps the County Commissioners signed up for insults—but the staff did not. 2. Maximum number of dwelling units to be constructed was reduced from 1,510 to 1,250 – a reduction of 260 units. 3. The percentage of dwelling types shall be 70% single family detached and 30% townhouses. 4. Multi-family, two-over-two dwelling types are eliminated and not permitted. 5. One-half of the permitted dwelling units (625) shall be age-restricted (55+). 6. There will be no access from the PUD to Weller Road. Because these modifications significantly changed the MTC proposal, the BOCC decided to send the rezoning case back to the County Planning Commission for additional review, and then to resume BOCC consideration of the case at a later time. This time, the Planning Commission voted 7-0 to approve the modified MTC proposal. APRIL HEARING BEFORE THE BOCC. After clearing the Planning Commission a second time, the rezoning case came before the BOCC again, beginning April 8, 2014, and concluding on April 23, 2014. All previous testimony and evidence that was a part of the BOCC hearing in January remains in evidence and a part of the record. The hearings beginning April 8th resulted in additional evidence, a major part of which was repetitive of the evidence presented in January. The BOCC decided to take evidence on both the rezoning aspects of this case and on the Developer Rights and Responsibilities Agreement (DRRA) aspects of this case, and to consider all of this evidence in connection with its rezoning vote and its vote on the DRRA at the end of the case. I support this procedural decision in order to make sure that the evidentiary record is complete and thorough for both parts of the MTC applications. The new evidence submitted at the April hearing confirms that the modifications made by the BOCC in January would indeed significantly reduce the impact of the MTC development on roads, schools and water and sewer. For example the number of students projected from the modified plan is approximately 60% less than in the original plan. The projected traffic increases are also less. The evidence supports a finding that the MTC development is fully consistent with the County Comprehensive Plan and that the development will result in adequacy of roads, schools and all other requirements. SUMMARY OF HEARINGS BEFORE THE BOCC. There were approximately one hundred citizens who spoke against the MTC development at the January 2014 hearing. Most of them asked the BOCC to reduce the size of that 1,520 unit development. After three days of testimony, the BOCC did that—reducing the project by 1/6 (by 260 units) and by requiring that half of the remaining units be age-restricted (55 and older). This reduced the projected number of new students by approximately 60%. It also lessened the impact on roads. When the hearings before the BOCC resumed on April 8th, approximately 30-50 residents continued to speak out against the modified MTC development. For the most part, the remaining citizens asked, demanded or threatened the BOCC to not approve it. At the April hearing, MTC opponents criticized every conceivable aspect of the MTC application. Some said it would make their bad roads worse; some said it would cause more people to be killed; some said it would make traffic congestion worse; some said that emissions from the power line adjacent to the proposed high school site would endanger the lives of students; some said that seniors would not want to live in the proposed senior housing; some said that the Traffic Impact Study was wrong; multiple challenges were made to the sufficiency of the MTC application; they challenged the initial community meeting; they challenged the contiguity; they challenged every conceivable aspect of the application—hoping some challenge would stick. Many of the opponents made it clear that if the BOCC approved the MTC, then they would challenge it in court, and that if they lose there they will still continue to oppose it. The hearings were considerably longer than has been customary in a re-zoning case because the citizens became aware of their right to cross-examine every witness. And so they did. There would be 20-40 citizens exercising their cross-examination rights as to every witness, which resulted in considerable repetition and irrelevant testimony. We heard from many of these residents three or four times in three days, and they repeatedly made it clear that they would not be satisfied with approval of any reasonably modified version of the MTC project. At the January hearings on MTC, most residents who testified asked the BOCC to cut back the size of the project. The BOCC did this—voting to make significant reductions in the size of the development, but continuing to retain the 49-acre site for a school and continuing to require $40,000 per unit of impact fees for each residential unit. This development will more than pay for the impact it will have on area infrastructure. But when the hearing resumed in April, the anti-MTC residents changed their theme from one of asking for reductions in the development to demanding disapproval of the MTC altogether. The tenor and tone of most of the public comment of most of the anti-MTC speakers became personal, angry, hateful, threatening and insulting. The only acceptable option for most of these people was to totally reject the project. But this would not be a fair or proper disposition. Some residential development at and near to the intersection of Routes 75 and 80 is smart planning because of the secondary road access; this is an area where the County will need a high school; the MTC project can be made to fund some key, needed road improvements; and the impact fees ($40,000/unit) that will be required through the DRRA and otherwise, will be more than enough to pay for the impact caused by this development; and this residential growth will not be a drain on other county taxpayers. This is the best place for residential growth in the county, and through appropriate growth here, we have the opportunity to begin to fund needed road improvements in the Route 75 corridor. MTC development will not pay for the infrastructure needs that it will create, and that the MTC development will cause property taxes to increase for all of the county taxpayers. There is no basis to support this conclusion. In fact, since impact fees are being collected in the amount of approximately $40,000 per unit in MTC, it is not expected that the building of MTC will cause tax increases for the rest of the county. It is true that prior development, including in the Monrovia area did not pay their share of infrastructure improvements needed to keep pace with development. But the impact fees that are now in place were calculated to insure that new development paid for the road, schools, rescue, library and water/sewer infrastructure that would be impacted by development. The DRRAs that are being made will obtain even additional payments for infrastructure improvements. The proffered high school site is not acceptable for a high school. Several citizens have argued that this is the case, primarily insisting that the location of the high power lines would make the site unacceptable. Some have argued that the site doesn’t satisfy any of the BOE’s site criteria. But none of these objections are based upon sound, factual reasons. The BOE staff has reviewed the proffered site, and a letter was sent to the BOCC stating that the BOE has no objection to this site for a potential high school. This BOCC has allowed too much growth—so much growth that it has overburdened our infrastructure. This is not true. Permits for new housing in Frederick County have been very low for the past 12 years. From 2003 – 2011, those permits averaged about 700/year—1/3 of average from 1986 – 2002. In 2012 the number increased to almost 1,000, and in 2013 the number increased to approximately 1,220 – still less than half of the amount of the 86-02 period. And the number has yet to reach the 1,500 mark, which the prior Board regarded as good and proper. To state that this Board has caused too much growth is patently false. However, it is true that prior growth did not always pay for all of the infrastructure improvements that it required. But that is not the case with the new developments that this Board has approved. Through impact fees and DRRAs, this Board has required new development to fully pay for the infrastructure improvements that will be caused by their development. The projects approved by this Board will cause development to outpace infrastructure. Not so. These projects are being required to pay for the infrastructure improvements they will cause. The fact that there are more residential units in the pipeline does not mean that they will all be built, nor does it mean that they will out-pace infrastructure improvements. DRRA. There will be a Developer Rights and Responsibilities Agreement (DRRA) in connection with the MTC. This will benefit both the developer and the County. The developer will have the assurance that the County will not pull the plug on their project after they invest millions of dollars into infrastructure improvements. The County will secure additional improvements and payments for some of the impact of the growth. Prior to the current BOCC, the County had never before used DRRAs. But this Board has. DRRAs bring in more money and move valuable improvements for the County than have ever before been obtained. Developers have agreed to this because it gives them predictability and security, knowing that the County will not subsequently downzone their property after they have begun to sink millions of dollars into infrastructure improvements. And in case you are not aware that prior Boards have actually done this, I will take this opportunity to remind you. A prior Board abruptly stopped development at Lake Linganore, and that developer subsequently went bankrupt. And in 2010, the prior Board abruptly stopped the previous development of MTC that the County had approved in 2006, and in which that land owner had made considerable expenditures, as they were relying on the County to keep its word in allowing them to build what the County had already approved. A prior BOCC took the position that it could “legally” terminate a planned development project that the County had approved. There is a pending court case to resolve this—which is currently stayed, while the current MTC application is under consideration. But even if it might have been “legal” for the County to pull the rug out from under that project—even if the County could get away with causing that developer to waste millions of dollars on a project—only for the County to later change its mind and say “No, you can’t build it”—it certainly is not fair to do it. It is important that the County be reliable, consistent and fair in its dealings with people—and this requires that the County be consistent with and supportive of its own plans—and not change long-standing plans except for compelling reasons. The prior Board violated this policy to the detriment of hundreds of property owners around the county, and to the detriment of the economic strength of this county. Demands of fairness and ethics require that the County re-commit to an appropriate development at the MTC. CITIZEN INPUT. The zoning change process requires a community meeting, but there are no specific requirements of notice, attendance or location. Perhaps in the future there could be some specificity added to this meeting requirement. However, one thing is quite obvious in this case—the community has been well aware of the MTC proposal, and many of them have let their opinions and comments be known in great depth, creating hundreds of pages of letters and documents. It cannot be said that the community did not have significant input in this planning process. There have been hundreds of pages of input from citizens on the MTC proposal, including petitions, emails, letters and expert reports. I have reviewed these submittals, and analyzed and considered them. It is because of this input that I believe that substantial modifications had to be made in the MTC proposal in order to obtain my approval. While I believe that a residential development is appropriate and warranted, it is my opinion that the number of units should be reduced, that the elimination of 2-by-2s should be made, and that making approximately half of the remaining development age-restricted would be appropriate. Of course, this will result in a reduction in some of the payments and improvements that the developer would be required to make to the County, but I believe the end product will be better. PRIORITY FUNDING AREAS. It is very important that major developments be planned so that they can qualify to be priority funding areas (PFAs). This will qualify the County to obtain State funding for infrastructure (including water, sewer, roads and schools). To do this, State requirements are that net residential areas be zoned with a density of at least 3.5 dwelling units per acre. For this reason, it is critical that this standard be met with the MTC proposal. To meet this requirement, the MTC had to include approximately 1,200 dwelling units. The 1250 units approved would yield 3.7 dwelling units per acre, which satisfies the density requirement to become a PFA. I, like most people in Monrovia, prefer neighborhoods with houses on 1-5 acre lots. Maryland law does not forbid them. But in order to get State assistance with water, sewer, roads and schools, developments must qualify to be in Priority Funding Areas. We have every reason to expect that the MTC development will be designated a priority funding area. FUNDING FOR ROADS. The MTC project will help bring about improvements to Route 75 that would not otherwise be addressed. While the developer will be making some valuable and necessary road improvements, the developer will not be providing all the funding needed to improve the roads that will be impacted by the MTC. But these improvements will help upgrade roads that are in great need of improvement. But these improvements are not all that will be needed. The County recognizes this, and in our transportation funding request to the State in 2014, the County made project planning for improvement of Route 75 our top funding priority for secondary roads. The County intends to continue to work for financial help from the State, and we fully expect to get it. In the last five years the State has spent $100 million in adding the East Street Interchange on I-70 and $43 million in improving the South Street interchange on I-70. The State is also paying for a new bridge at the Motter Avenue interchange with Route 15 at a cost of over $14 million. Within the last year the State committed $83 million to build the Monocacy Boulevard Interchange on Highway 15. We fully expect the State to contribute funding in the future to improvements on Route 75. SAFETY CONSIDERATIONS. At the April hearing several people testified that there are many accidents on Route 75, such that the road is not safe unless it is improved. Several people demanded that Route 75 be improved before allowing the MTC development to proceed. The MTC project includes numerous road improvements that will take place concurrent with or before development occurs. This approach, which is routinely required for all new major developments, will cause road improvements to keep pace with increased traffic. The problems that have led to accidents in the past were not caused by the MTC. The MTC development alone will not correct all the existing problems, but it will help. The County will concurrently work on planning, funding and building road improvements that will help alleviate existing problems. Some of the improvements will require State funding, and the County just took an important step to secure this when it made the Route 75 corridor its top secondary road improvement project. Making the MTC project a PUD is a necessary step in having the State identify this area as a Priority Funding Area (PFA). That designation is necessary to secure State funds for the needed road improvements. The text of the 2010 Comp Plan is a 390-page document that includes dozens of goals, policies and objectives on a range of planning aspects, including Agriculture, Natural Resources, Transportation, Economics, Water Resources, Citizen Services, Historical Resources and Planning Principles. Many of these goals and policies conflict, but the text calls for consideration of them so that the planning can be thorough, and so that the best balance possible can be achieved between these conflicting goals and objectives. Ms. Rosenfeld also argued that because the September 13, 2012 Resolution did not specifically address the findings stated by the prior Board in its “whereas” clauses in the Resolution adopting the 2010 Plan, that therefore those findings remain undisturbed and that they supersede the September 2012 Resolution. This is patently absurd and incorrect. This very issue has been litigated before three different judges in the Circuit Court for Frederick County, Maryland, and each judge has rejected this argument. Some people argued that with the approval of residential projects in Monrovia that this violates the 2010 Comp Plan because the supply of housing would be increasing while the demand for housing is decreasing. First, the 2010 Comp Plan does not control. Second, the 2012 Comp Plan does not prohibit such a situation. In addition, I would point out that the fact that the housing supply exceeds the demand is not a bad thing. It keeps the price of housing lower than it would be. Further, this situation does not necessarily cause excessive growth. Residential growth occurs when the jobs exist to support it and when financing exists to help buyers. Both factors must be present. Currently the economy will not support much residential growth. During the past ten years the average number of permits for new homes in the county has been slightly more than 700/year. Only in 2012 and 2013 have these numbers improved (approximately 1000 in 2012 and 1220 in 2013). Although some no-growthers are arguing that the County is already growing too fast, this is false. And the prospect of growing too fast in the future is not supported by factual evidence. This Board has put in place significant impact fees, and the slow job growth will prevent the demand for new homes to grow very fast. Since the actions of this Board is allowing an increase in the supply of residences, what will happen is that the homes will be built and bought in the most desirable locations; and this will also prevent developers from building homes that do not have the expectation of being bought. CONCLUSION. I voted is support of the modified MTC development because I believe it will be best for Frederick County. While there were 40-50 residents who persisted in calling for a total elimination of the MTC project, I did not find their arguments convincing or reasonable. They basically argued that there should be no residential growth in the Monrovia area unless it was on well and septic on one-acre lots. This is possible, but it would preclude the County from any hope of getting State funds to help with the schools, roads and other infrastructure needed in this area. It would preclude the acquisition of a 49-acre school site at no cost. It would preclude the developer from making over $10 million in road improvements to Route 75—improvements that will improve the safety of the road from what it is now. Passage of the modified MTC will increase the population in this part of Frederick County, but it will bring it to the best place in the County for this growth—the triangle between I-70, I-270 and the Montgomery County line. This area is accessible to more, high-paying jobs than any other part of the county. While there will be more residences in this area, there will still be substantial open spaces; for example the area west of Route 75 (between Route 355 and Route 80) will continue to be zoned Agriculture. The current BOCC restored the valuable property rights that the prior Board took from over 200 property owners in the County. This Board is allowing development in the Monrovia area, as it has been planned by the County for over 40 years. This is the best place for a limited amount of residential growth. The growth projected from MTC will not outpace the supporting infrastructure, and it will not cause increased taxes for other county residents. Because of the substantial impact fees and the requirements that this Board has secured through DRRAs, this growth—when it does occur—probably over the next twenty years—will pay for itself. Monrovia will continue to be one of the premier residential neighborhoods in the county, and its major roads will be improved. approved by the Planning Commission and the Countywide Comprehensive Plan and maps as hereby approved and adopted by the Board of County Commissioners, the Countywide Comprehensive Plan and maps adopted in this Resolution by the Board of County Commissioners shall govern and to the extent of any inconsistency the Planning Commission Countywide Comprehensive Plan and maps are hereby overruled as provided in Article 66G Section 14.06.